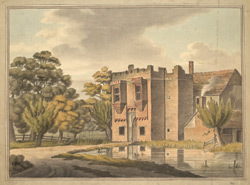 View of Rye House in Hertfordshire. The house is situated in the marshes that surround the River Lee at Hoddesdon and was built in 1443 for Sir Richard Ogard who wanted a manor house built from brick. Brick-making was very rare in England at this time and so the house was very unusual. In 1683 the house became infamous after the ‘Rye House Plot’ was hatched here by Cromwellian Richard Rumbold (who owned the house). Lord Shaftesbury and the Earl of Bedford were amongst a group of men who conspired to kill King Charles II and his brother. One of the conspirators betrayed the others and many were executed, at the Tower of London. Rumbold protested his innocence but he too was executed. Rye House was used as a parish workhouse for a time but later became a tourist attraction when the 'Great Bed of Ware' was moved here in the late 19th century.